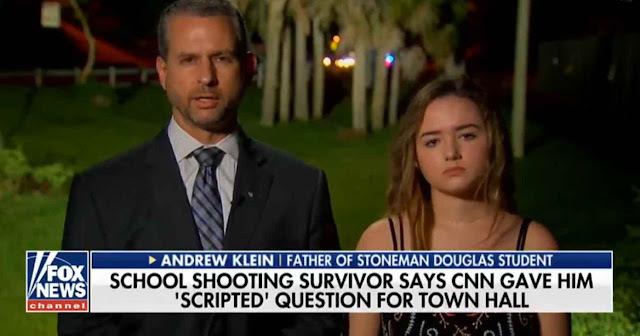 (Jack Burns) In their alleged attempt to control the narrative on the tragic shooting in Parkland, Florida last week, CNN has been accused of scripting the very testimonies from survivors to propagate their agenda. While CNN denied doing this to Colton Haab yesterday, as TFTP reported, another survivor has come forward with similar claims. Andrew Klein’s daughter survived last week’s deadly school shooting at Stoneman Douglas High School. Klein came forward Thursday accusing CNN of attempting to control the narrative in favor of gun control instead of an open uncensored town hall on how such tragedies could be prevented in the future. Ingraham picked up on the fact the CNN producer was attempting to control the narrative and asked Klein to explain. Klein said the CNN producer did not specifically mention guns in her conversation with Klein but said the producer was, “looking for people who want to talk about the policy implications”. As TFTP reported on Thursday, CNN was not only caught red-handed using scripted questions for its contentious town hall meeting with Senator Marco Rubio (R) and NRA spokesperson Dana Loesch but allowed members of the audience to call the guests “murderers” and other derogatory names for taking a stand in support of the Second Amendment. Klein is the second person this week who has come forward to accuse the Cable News Network of attempting to politicize the shootings, turning the debate into an anti-gun one. Although CNN denied it, Haab was equally vocal in his criticism of CNN’s attempts to turn the tragedy into an attack on the Second Amendment. Haab was asked to write an essay about the shooting and he complied only to find out CNN took his essay and in return, handed him a scripted question. He refused to attend the town hall saying if he couldn’t ask his own unscripted question “it would be a total waste of (his) time”. They had taken what I had wrote and what I had briefed on and talked about, and they actually wrote the question for me. Haab did not attend CNN’s town hall as a result but did go to his local news station where he was allowed to speak freely about what he thought could have prevented the school shooting. He also spoke with Tucker Carlson and said if his coach had his gun on him he would have been able to engage the school shooter in a firefight and possibly prevent the tragedy. That’s not the message CNN wanted Haab to deliver, evidenced by its alleged striking of all of his essay’s position substituted by the scripted question he says he was given. CNN denied Haab’s accusation in a tweet. It is not the first time CNN has been caught supplying scripted questions. As TFTP has reported and Wikileaks confirmed, the Democratic National Committee (DNC) primaries were rigged against candidate Bernie Sanders. Not only did the highest ranking members of the DNC work against Sanders bid to become the Democratic nominee but CNN worked hand in hand with the DNC to ensure Hillary Clinton won the nomination. After DNC chair Donna Brazille resigned from her post following Wikileaks publication of DNC emails showing DNC staff attempting to discredit Sanders by attacking his faith, she found a new home at CNN. While working as a paid staffer for CNN, she was caught passing primary debate questions to Clinton’s staff, giving Clinton’s team an edge in what should have been a free and open debate. Clinton went on to win the primary and the nomination for the Democratic Party to run for president. But several Sanders supporters sued the DNC in court alleging bias on the part of the DNC against their candidate. The DNC was not supposed to show favoritism for one candidate over another and the plaintiffs allege fraud took place in the election. Now it seems the DNC is at it again, except this time they’re using CNN to control the narrative following the latest school shooting massacre. Conveniently absent from the narrative is any discussion of psychotropic medicines something TFTP has long contended is the common denominator in nearly all school shootings. Not only are nearly each and every one of the school shooters medicated on psychotropics but no one is calling for a discussion about them. Instead, politicians are guiding citizens’ anger toward the object used for killing instead of the potential cause for the callous murdering of one’s classmates.